Hindu Puranas are a perfect amalgamation of mythology and religious doctrine. They contain stories and teachings based on the principles of Vedas and Upanishads. They play an important role in Hindu religion. The roots of many modern day Hindu festivals and rituals can be traced back to the Puranas. Apart from the stories of gods and goddesses in Hindu pantheon, it deals with subjects like the creation of universe, geography, philosophy, psychology and many other topics. The stories of many characters not found in Mahabharata and Ramayana are elaborated in the Puranas. Many incidents left out in the epics are discussed in detail in the Puranas. Purana means 'old' and it is believed that they were compiled by Sage Vyasa. There is a belief that the teachings found in Upanishads and other similar Hindu scriptures could not be understood by common man. The stories in the Puranas are an attempt to get the teachings of Vedanta to the masses. Puranas are full of symbols and modern Hindus are yet to decipher majority of the symbolism hidden in stories in the Puranas. Not even ten percent of symbols have been properly understood by majority of the people. There is a particular method to the writing of the Puranas. Amara Simha, Sanskrit lexicographer, details about the divisions of a Purana. 2) Its destruction and renovation. 3) The genealogy of gods. 4) The reigns of Manus. 5) The history of the kings and their races. Vishnu Purana, Naradiya Purana, Padma Purana, Garuda Purana, Varaha Purana, Bhagavata Purana, Matsya Purana, Kurma Purana, Linga Purana, Shiva Purana, Skanda Purana, Agni Purana Brahmanda Purana, Brahmavaivarta Purana, Markandeya Purana, Bhavishya Purana, Vamana Purana, Brahma Purana. 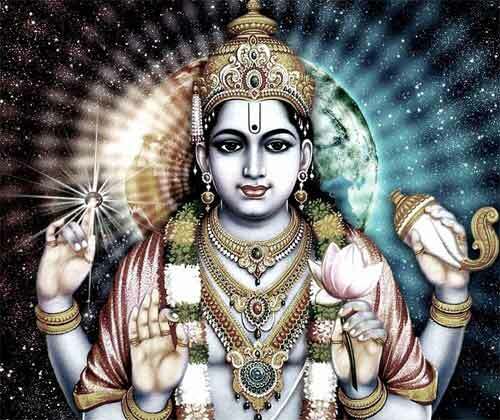 Lord Vishnu, Shiva, Brahma and Shakti are the important deities discussed in the Puranas. Bhagavata Purana is the most popular Purana. Chandi or Devi mahatmya read during Navratri are part of Markandeya Purana. Sanskrit is the language used in Puranas. Most of them have been translated into English and other regional languages. Several Puranas are available online and some of them can be downloaded.